Former Chief Cowan advanced through the ranks of the Jersey City Police Department through a competitive testing and selection process administered by the New Jersey Department of Civil Service. Get started with an investigator you can trust. Contact Former Jersey City Police Chief Bob Cowan For A free 30 minute consultation. If your gut is telling you something in your relationship is not right, and you suspect your partner is cheating, more than likely you are right. Cowan Investigations has the latest high tech surveillance equipment which will gather the evidence you need to determine how to best move forward in your relationship. Surveillance is an art form for a New Jersey Private Investigator, Cowan Investigations is an artist when it comes to the conducting of investigative surveillances. In most investigations some form of surveillance will be required, Cowan Investigations has all the latest technology in order to complete the surveillance while at the same time avoiding detection. Bob Cowan the former Chief of the Jersey City Police Department with close to thirty-five years-experience moved up through the supervisory ranks by way of a competitive process. Prior to being appointed Chief of Police Bob was the primary and final decision maker in a myriad of incidents such as: domestic violence, child abuse, child endangerment, and child custody. Clients in search of New Jersey Private Investigators put a lot of weight to testimonials and any client feedback they can find when searching for a private investigator? But how many of the testimonials posted are actually real? Aside from the testimonials posted on the Cowan Investigations Website there are also multiple Five-Star Google Reviews posted on the internet. At your request Cowan Investigations will also provide you with the contact information for former clients who have volunteered to vouch for our services. New Jersey Cohabitation Investigations conducted by Cowan Investigations are thorough and professional from the inception of the investigation until our appearance in a New Jersey Court. Former Chief Cowan’s thirty-five-years of law enforcement experience has given him an enormous understanding of how to obtain legally admissible evidence. Do not trust your Cohabitation Investigation to a New Jersey Private Investigator who will improperly collect evidence that will be inadmissible in Court. Upon request references are available from former clients of Cohabitation Investigations. Contact Cowan Investigations for a free thirty-minute no pressure confidential consultation to discuss your case. While you are afforded 100% confidentiality at all times, the initial consultation will not request the disclosure of any information that will reveal your identity, the identity of the investigation target, or the exact location of the investigation. 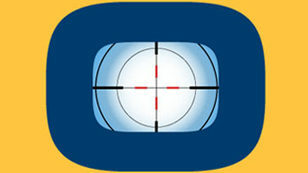 Cowan Investigations will only ask for very general information in order to formulate an action plan. Don’t let the private investigator business remain a mystery, contact Cowan Investigations for a free consultation. 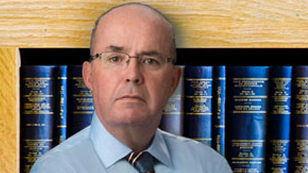 The former Chief of Police of Jersey City, Bob Cowan of Cowan Investigations, puts his highly advanced detective skills to use in providing private investigative services for all of New Jersey Counties, including communities in and near Bergen, Monmouth, Mercer, Middlesex and Ocean Counties, NJ. 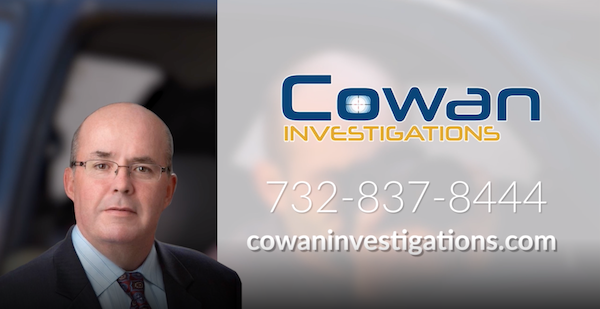 Continue below to learn about what Cowan Investigations can do for you. If your instinct tells you something in your relationship is not right, and you suspect your partner is cheating, then you might need to find out if your suspicions are correct — but how? Cowan Investigations will find and gather the hard evidence you need to determine how to best move forward in your relationship, utilizing the latest in high-tech surveillance equipment. When fighting for the legal or physical custody of your children, retaining the services of a skilled private investigator in combination with a qualified, local NJ lawyer can go a long way in making your case. A knowledgeable and seasoned private investigative agency such as Cowan Investigations, with their detailed knowledge of the court system, can help you acquire the legal evidence you need for presentation in a New Jersey Family Court. Cowan Investigations’ conducts cohabitation investigations in a thorough and professional manner, all the way from the investigation’s beginning until our appearance in a New Jersey Family Court. From his 35 years of law enforcement experience, former Chief Cowan possesses an incredibly deep and nuanced understanding of how to obtain legally admissible evidence. Do not trust your investigation to a private investigator who will improperly collect evidence, ultimately causing the evidence to be inadmissible in a court of law. Cowan Investigations has saved individual clients hundreds of thousands of dollars that their ex-spouses were fraudulently collecting! If you don’t believe Mr. Cowan at his word, he will put you in touch with former clients that would be happy to vouch for him. Investigative surveillance is an art form for a private investigator, and one which Cowan Investigations has thoroughly mastered. Most investigations require some sort of surveillance, and Cowan Investigations has all the latest technology to complete the surveillance while simultaneously avoiding detection. Cowan Investigations has multiple vehicles to deploy into the field, including a special surveillance vehicle enabling the investigator to observe from the rear of the vehicle while remaining undetected. 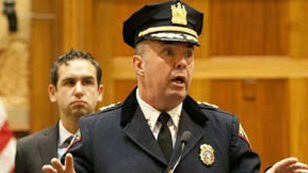 Bob Cowan is the former Chief of the Jersey City Police Department. With nearly 35 years of experience, Bob moved up through the police ranks through a highly competitive process. Before being appointed Chief of Police, Bob was the primary and final decision maker in a myriad of incidents, including domestic violence, child abuse, child endangerment, and child custody issues. Bob also routinely oversaw investigations of shootings, aggravated assaults, robberies, and narcotics complaints, while also surveilling in order to fight and prevent such crimes. When searching for the right private investigator to hire, having access to honest testimonials and feedback from past clients is absolutely essential, but how many of the available testimonials are genuine? To put your mind at ease, Cowan Investigations will, at your request, provide you with the contact information of former clients who have volunteered to vouch for our services, as a supplement to the client testimonials listed on this site. Call Cowan Investigations today for a free, 30-minute, no pressure, confidential consultation when you need an experienced alimony investigator, background investigator, and any other type of private investigator in New Jersey to discuss the outline of your case. You will be afforded 100% confidentiality at all times, and the initial free consultation will not request any information that will reveal your identity, the identity of the investigation target, or the precise location of the investigation. Cowan Investigations will only ask for very general information to help formulate an action plan. Just because we are private investigators, it doesn’t mean that we have to remain a mystery. If you are looking to find and hire the services of the best PI anywhere in New Jersey including Bergen, Monmouth, Mercer, Middlesex or Ocean County, NJ, call Cowan Investigations for a free consultation today.